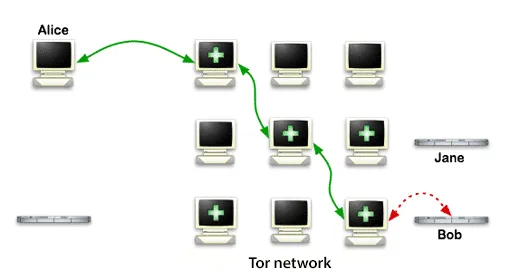 TOR (abbreviated from The Onion Router) – is a network of proxy servers which allow to install an anonymous network connections. The technology involves anonymous data can be used to browse the web, send email and instant messages. Each data packet passes through 3 random Tor proxies. 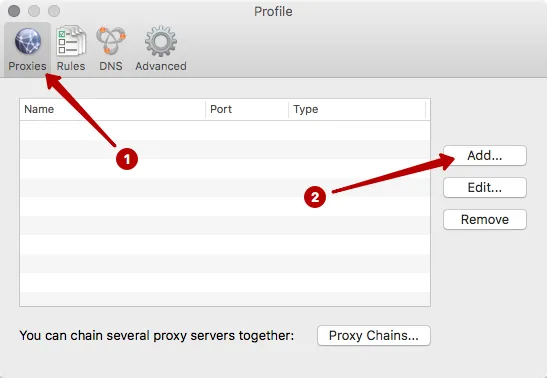 Such proxies are called nodes. 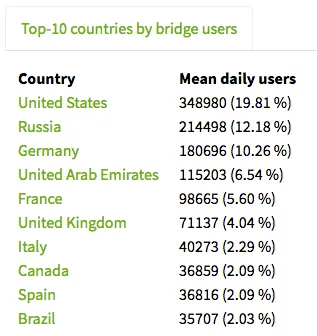 Below is the statistics - 10 countries which the most active use of the Tor network. Statistics taken from the official website of the Tor Project. The user runs the Tor client on your computer. Tor client downloads a list of Tor nodes. Green arrows - the data transmission is encrypted. Data is encrypted sequentially three keys before sending. The data packet is sent to the entry node of the Tor network. The entry node decrypts the "top layer" cipher and learns the next node to send a data packet. Intermediate and output nodes are also coming. The analogy of how clean the onion in layers. Software is a Socks interface. Therefore, all programs able to work through the Socks protocol, can operate through Tor network. Red arrows - unencrypted data. If you use Tor for a while, you will notice that the output IP address changes periodically. This is due to the random change of nodes in Tor network. Due to the periodic change of the Tor network nodes is achieved by anonymous. Tor allows to provide anonymity to servers. Access hidden server is only possible when using a Tor client. Such hidden service will work through special pseudo-top-level domains .onion. The Tor network recognizes these domains and redirects the traffic within its network. Domains .onion can not be blocked by the ISP as it is a pseudo-domain, and access to it is only possible through the Tor network. Tor can be used for different purposes, but the general sense - it is a safe and anonymous use of the Internet. journalists to communicate with informants and anonymous data transfer. Edward Snowden admitted to using Tor for the transmission of classified information to the Washington Post and the Guardian. ISP knows that you are using TOR, as the list of entry nodes is in the public access. We recommend using VPN + Tor chain. web sites have learned to detect using Tor, even if it is used in VPN + Tor chain. 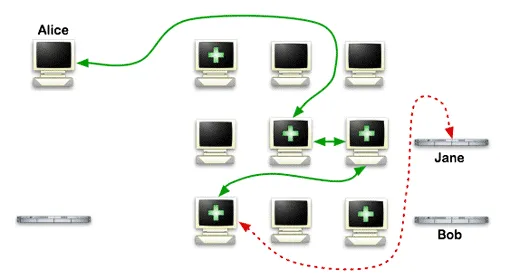 This indirectly reduces your security and allows Web sites to block such connections. 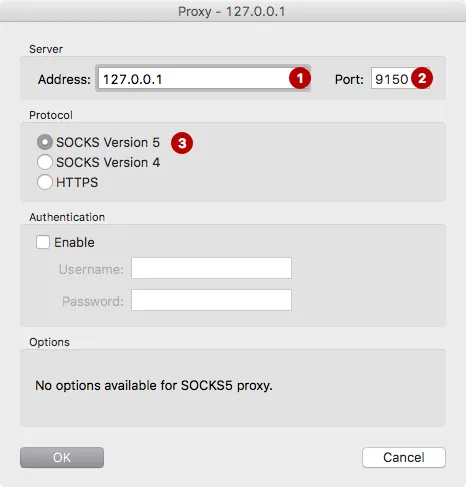 We recommend using a chain VPN + Tor + (Socks, SSH in a virtual machine or a Dedicated Server). In this case, you will hide the use of the Tor network from the Internet service provider through the use of VPN. 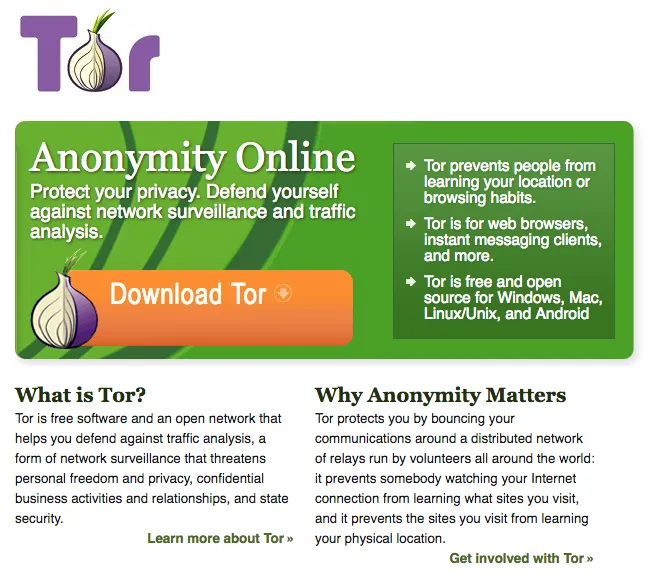 The Tor network will increase the level of anonymity. 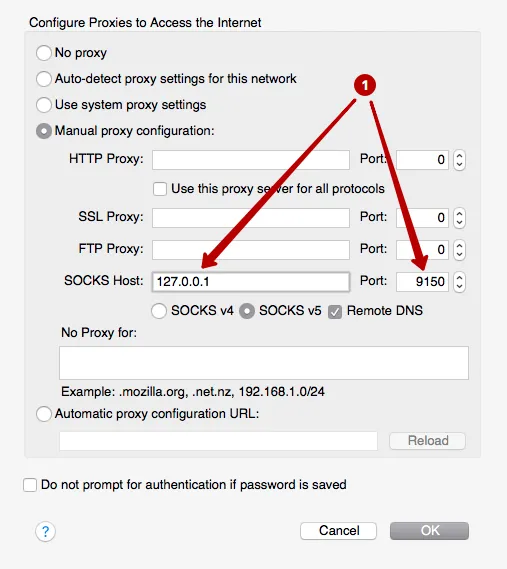 Socks, SSH or Dedicated Server at the end will not allow Web sites to detect the use of the Tor network. node can be compromised, and there are cases when the Tor network to add special nodes that bugged user traffic. At the moment, the Tor network protection does not allow to listen to the traffic on all 3 nodes, which ensures the safety of users. ever-changing IP address can bring problems when working with web sites that block the actions of the user by changing the IP address. For example, banking sites track IP address of the user after login. If the IP address changes, the website will automatically re-login requests. Tor network proxy server using the TCP protocol, which complicates the work of programs such as Skype and Bittorrent, as they work through the UDP protocol. The Tor Project does not recommend using the Tor network to download torrents and streaming voice and video. The anonymity of the transfer of such data is not guaranteed. Tor Project was established research laboratory of U.S. Naval Forces in the federal order. Substantial financial support provided by the U.S. Department of Defense and the U.S. Department of State. In 2012, 60% of donations for the Tor project has been done by the U.S. Department of Defense and the U.S. Department of State. It was written in the newspaper Washington Post. 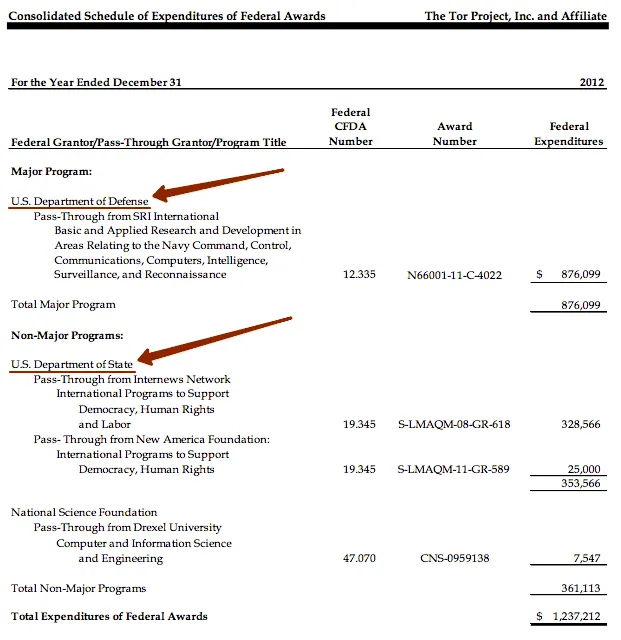 Screenshot of the report on the money from sponsors for the 2012 year. This report can be viewed on the Tor Project website. 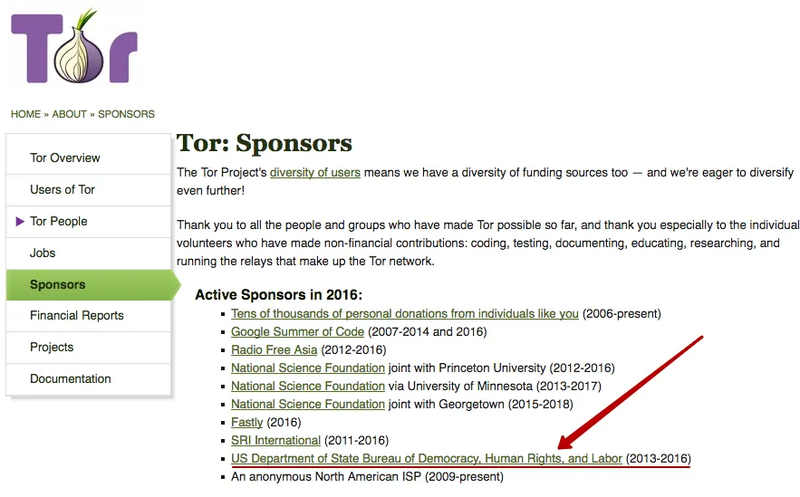 On the website can be found the list of Tor sponsors. For 2012 year the above sponsors are not specified. And from 2013 to 2016 U.S. Department of State (Bureau of Democracy, Human Rights and Labor) was as sponsor. At the same time on the site ceased to publish reports on the amounts of money received from sponsors. The U.S. Department of State and the U.S. Department of Defense are customers of PRISM program. Edward Snowden gave classified information to the Washington Post and Guardian and declassified program PRISM, which carries a total surveillance of users of the Internet around the world. Large U.S. corporations (Apple, Google, Microsoft and others) through the courts are obliged to cooperate with the developers of PRISM program. This does not inspire confidence on which side works Tor Project. Do I need to use Tor? Each user himself decides to use the Tor network or not. Now that you know all the pros and cons of the Tor network. We do not recommend using a Tor network as one means of anonymity. To feel secure an integrated approach to anonymity. Use several different technologies together with Tor like onion skins. For example: VPN + Tor + Socks, SSH or a Dedicated Server. 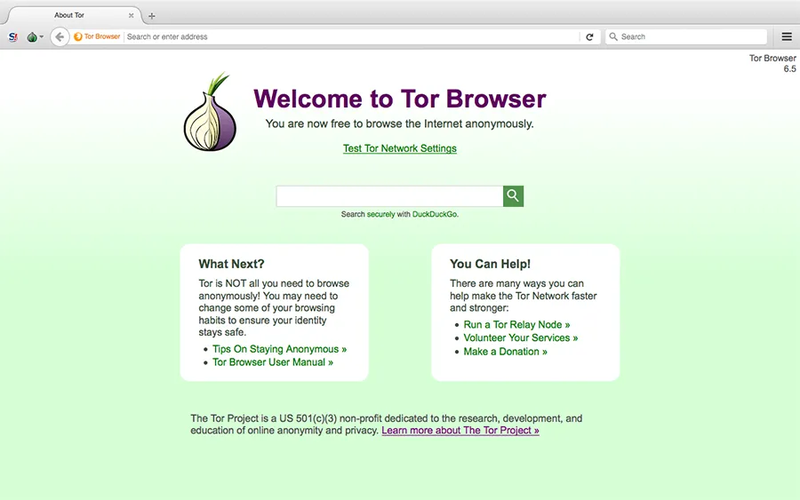 Download Tor Browser only from the official site torproject.org. Be careful! There are sites that mimic the Tor Project website. For example, the site torprojectS.org (added the letter S at the end) is trying to install on your computer a trojan. Do not download Tor Browser on third-party sites. By the way Tor Browser is made based on the Mozilla Firefox browser, since it is the only browser able to work independently with Socks connection without an operating system. After installing Tor Browser is fully operational. Below is a screenshot from the official website. do not install additional plug-ins, as it is likely to install a plugin that will give your actual location. All the necessary plug-ins are already installed for anonymity. do not open the documents (eg, PDF and DOC) while you are online. In such files can be embedded macros that have requested access to the Internet directly from the program, bypassing the Tor network. This compromise the your real IP address. do not download torrents on the Tor network, as it will increase the load on the network. Torrent program are arranged so that they always get access directly to the Internet, and do not consider the proxy settings. It can compromise your real IP address. use the https connection is always. This connection will ensure the security of data transmission. Low (default) – Standard security. Suitable for most users. Web sites are opened correctly and nothing is blocked. 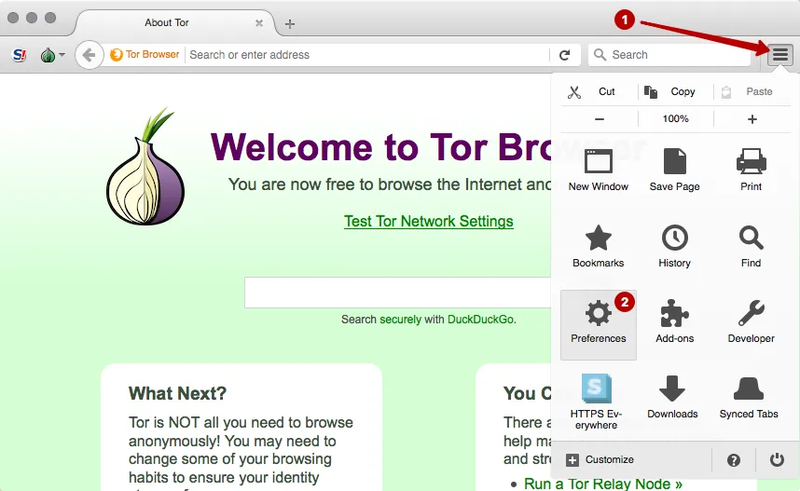 Tor Browser is ready for use, and you can immediately begin to surf anonymously. 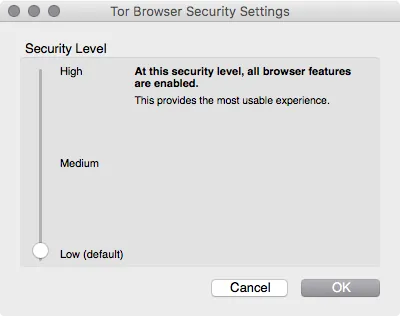 Note that using this setting only Tor Browser uses the Tor network. All other programs are using a direct connection to the Internet and send your real IP address. What to do with the programs that are not able to work directly with the Socks protocol? For example, e-mail clients, and other browsers, instant messaging programs, etc. 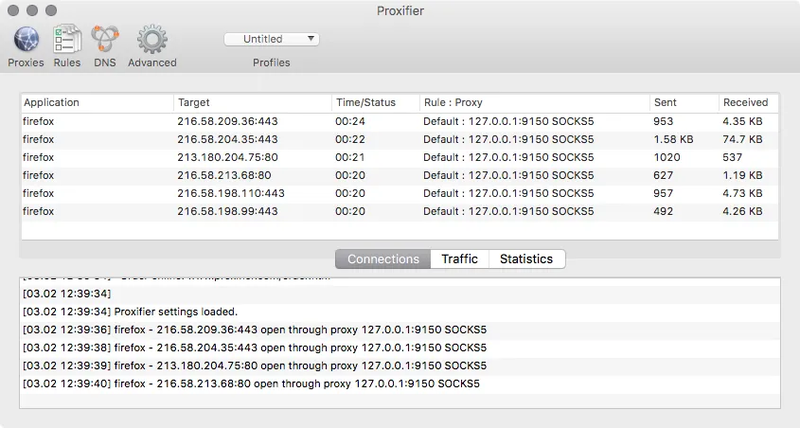 We recommend the use of Proxifier to redirect traffic of such programs in the Tor network. 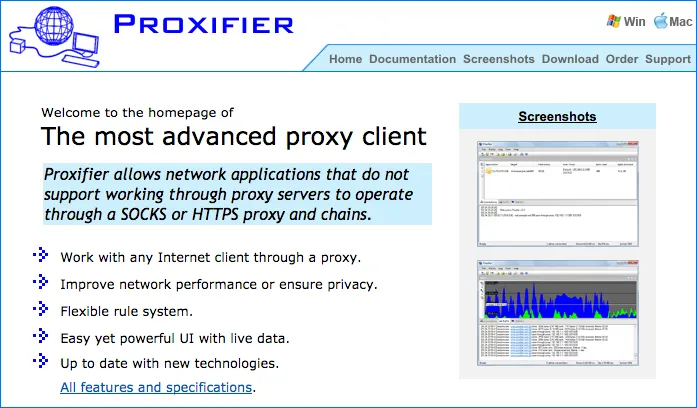 Home page of official site Proxifier. Install the program Proxifier. This program is able to collect the traffic from operating system and flowing through a certain proxy server. To configure Proxifier need to learn use the Tor network port. Go to the Preferences in Tor Browser. See use the local IP address and port of the Tor network connection. These data must be inserted in the program Proxifier to the entire operating system, traffic was held in the Tor network. In this example, 127.0.0.1 and port 9150. ATTENTION! It is important first to start Tor Browser and wait until the main window appears. And only after that start the program Proxifier. Click on the Proxies button. Enter IP address and port. In our example: 127.0.0.1 and port 9150. Click Yes - agree to use proxy by default. Open any browser or email program. In the program Proxifier you will see a list of connection through the Tor network. 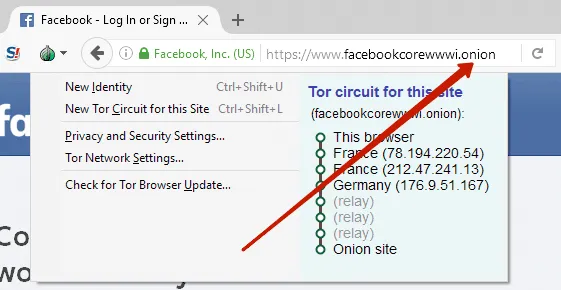 In any browser you can check your IP address and to make sure that will show the IP address of the Tor network, and not your real IP address. If something does not work, close the Tor Browser and Proxifier. And then start the Tor Browser and wait for the main window. Only then run Proxifier. No additional configuration is not necessary to do. All traffic will automatically go through the Tor network. 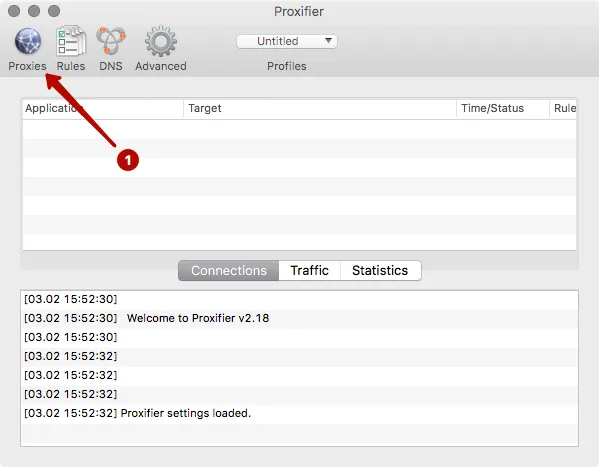 Close the program Proxifier, to reclaim your real IP address.